Syracuse University is among an elite group of academic institutions designated by federal agencies for research and education in information assurance and cyber security. 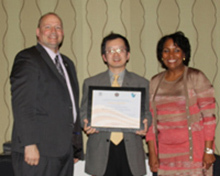 Associate Professor Joon Park, center, stands with Debora Plunket, director of the Information Assurance Directorate at the National Security Agency, and Douglas Maughan, Cyber Security Division director in the Homeland Security Advanced Research Projects Agency. Affirmation of its status as a National Center of Academic Excellence (CAE) in Information Assurance/Cyber Defense (IA/CD) institution, a newly introduced status, has been provided to Syracuse by the National Security Agency (NSA) and the federal Department of Homeland Security (DHS). In addition, the University was reaffirmed as an institution for CAE-R (research) programs, according to School of Information Studies (iSchool) Associate Professor Joon S. Park, the CAE point of contact at the university. Both designations are effective through 2021. The University received the maximum initial designation periods. Subsequent designation periods will revert to five years. The University originally received the CAE Education designation in 2001 and was re-designated in 2004, 2007 and 2012. The University received its first CAE-R designation in 2009. While more applications are under review by the agencies, the other academic institutions receiving both CAE IA/CD and CAE-R designations, at the present time, include Carnegie Mellon, George Mason, Iowa State and Mississippi State universities, Park says. In this first year of the new CAE IA/CD program, Syracuse is one of a total of 18 academic institutions nationally to have received the new CAE IA/CD designation. Through the CAE-R program, which was launched in 2007, 31 institutions nationally have received the CAE-R designation, making each individual designation also a distinguished honor, according to Park. NSA and DHS jointly sponsor the CAE programs to reduce vulnerability in the national information infrastructure by promoting education and research in information assurance/cyber defense education and research across a range of academic disciplines. Students attending CAE IA/CD (education) and CAE-R (research) schools are eligible for scholarships and grants through the Department of Defense Information Assurance Scholarship Program and the Federal Cyber Service Scholarship for Service Program. The CAE IA/CD (education) and CAE-R (research) are separate programs, but a CAE-R applicant must be an existing CAE or meet the CAE criteria. The overall CAE IA/CD requirements are demonstrations of program outreach/collaboration, robust IA/CD academic programs, IA/CD multidisciplinary efforts, practice of IA/CD at the institutional level, and student/faculty IA/CD efforts, as well as the courseware requirements. These include a core set of IA/CD Knowledge Units and a set of additional knowledge units to which institutions must map, according to Park. The overall CAE-R requirements are IA/CD faculty/student research activities, such as publication, research funding, graduate-level production and adequate subject matter preparation. Several dozen faculty and staff members members from across the University were involved in preparing the applications, Park says. That number included more than 30 colleagues at the School of Information Studies and other security-related faculty, instructors, program directors, staff and students across the campus at the College of Engineering and Computer Science, the College of Law, the Maxwell School of Citizenship and Public Affairs and the S.I. Newhouse School of Public Communications. Park serves as Syracuse University’s Point of Contact (POC) at the Center of Academic Excellence (CAE) in Information Assurance Education since 2010 and for CAE-R (Research, since 2008). Over the past decades he has been involved with theoretical/practical research and education in cyber security. He served as the founding director of the certificate of advanced study (CAS) in information security management program at the School of Information Studies for the last decade (2003-2013).